Casa Oceano is a gorgeous choice for anyone who wants to stay right on the beach. It’s in the Tango Mar Resort, which is a nature-lovers dream with turtles, monkeys, tide pools, and horseback riding at your fingertips. The staff is unbelievably helpful and attentive, and are available 24/7. This is a great choice for your Costa Rican vacation! Beachfront Villa surrounded by palms, wildlife, and ocean views! Casa Oceano is a luxurious, beachfront rental in the Tango Mar Resort that sits steps from the sea. Sunset and ocean views abound at this open-concept villa. Waves crash 10 steps away from the infinity pool, and the breathtaking ocean views stretch to mountains in the distance. There’s loungers and umbrellas at the border of the gardens, and several sun decks around the pool. The veranda has terra cotta tiles and wide glass doors that lead into the common area. A pass-through window connects the outdoor bar to the kitchen. Upstairs, there’s a lounging balcony with lots of shade and ocean views. Inside, there’s a large couch facing the sea and a glass-topped coffee table. The living room’s entertainment system features a 42” HDTV, a sound theater system, BluRay, and Bluetooth speakers. A dining table for 12 sits in between the living room and kitchen. The kitchen is designed for gourmet meals, which will be prepared by Chef Silvia. Her meals combine Costa Rican staples with international flavors, and receive rave reviews. A wraparound bar borders the kitchen’s stainless steel appliances and luxury features, like a crockpot, Kitchen Aid mixer, coffee pot, cappuccino machine, food processor, blender, and ice maker. Four bedrooms have ensuite bathrooms, and two suites share a bathroom. Five of the bedrooms have ocean views and four have balconies. The Guest Master, the Center East and Center West bedrooms are all upstairs, and accessed through a separate door immediately to the right of the main door entrance. The Main Master is also upstairs, and has a king bed with a canopy, a private balcony with seating, a garden patio, and an ensuite bathroom with a Jacuzzi tub and a shower. The Guest Master has the same amenities as the Main Master, but doesn’t have the additional garden patio. It overlooks the sun deck and the beach, and has a computer station. The Center West suite has a queen bed and a balcony. The Center East suite has two queen beds, a balcony, and a two-person Jacuzzi. Downstairs, the Ocean Patio suite has a king bed and direct access to the pool deck, while the Rear Garden suite has two queen beds and faces the garden. Casa Oceano has a permanent staff that includes an English and Spanish-speaking concierge, a housekeeper, and groundskeeper. If guests opt for the additional meal plan, a chef is included. 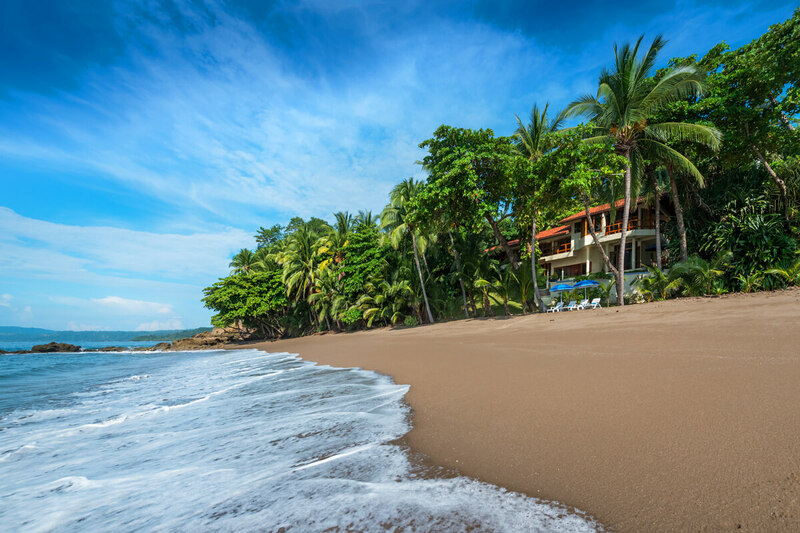 Casa Oceano has access to 6 boogie board and 3 surf boards, tide pools for the kids, a waterfall hike, horseback riding, monkeys, wildlife, and nearby tours to keep guests constantly entertained. Upon arrival at the Tambor airport guests will be greeted by Hansel and transferred to the villa. Departure transportation is also included. Car rental, private chef, grocery and beverage shopping (pre-arrival and during your stay), liquor and wine delivery, nanny service, baby equipment, spa services, yoga and personal training, photography, and a private driver can be arranged for an additional fee.